Select Concepts is a trusted family owned Australian company and is the leading specialist company in the design, production, supply and installation of Permanent and Portable Staging Systems, Choir Risers and associated Stage product solutions. Customer service is a major priority and at Select Concepts we design and manufacture Stage Systems ideal for our diverse Australian entertainment, event, marketing and education industries. Extend the capabilities of your existing stage or create new with our guaranteed Australian manufactured Stage designs and systems. QUATTRO Fold and Roll Stage Podium. 600mm high. How to correctly lower the podium. 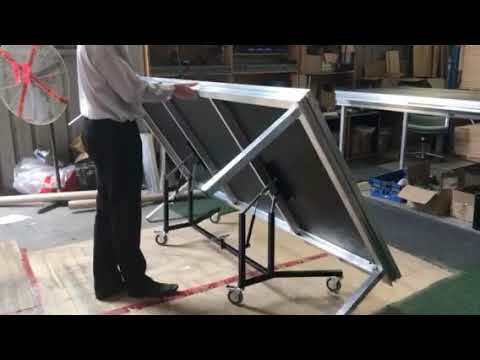 QUATTRO Portable Fold & Roll Stage Systems 300mm and 400mm high. How to assemble. WHO WOULD USE A PORTABLE STAGE? HOW DO I PURCHASE OR ORDER A STAGE? WHAT THINGS DO I NEED TO CONSIDER WHEN BUYING A STAGE? Who will use and assemble the Stage, what will the stage be used for, what finish on the Stage decks are required and what is the best Stage system for me? HOW LONG WOULD IT TAKE TO DELIVER A NEW STAGE? Most of our Stages are dispatched within a week of placement of order. Freight to different parts of Australia takes varying amounts of time, but we can advise on this on request. I’M INTERSTATE FROM SELECT CONCEPTS – CAN I STILL BUY A STAGE FROM YOU? YES – we distribute our Stages Australia wide and even overseas! Distance is no problem! HOW BIG DO I NEED MY STAGE? This will depend on the intended use of the stage and how many people would be on it at one time, as well as the available room both when assembled and stored away. HOW MANY PEOPLE ARE NEEDED TO ASSEMBLE A STAGE? HOW IS MY STAGE DELIVERED? Most of our Stages are delivered via reputable freight companies, and hand unload or tailgate unloads are available if required. HOW WOULD I WORK OUT HOW BIG A STAGE I NEED? We liaise with you to provide the best Staging solution for your requirements. We can advise you based on our years of experience. WHAT LOAD RATINGS DO THE STAGE SYSTEMS HAVE? The QUATTRO Systems have a flat load rating of 770kg/metre square, the PILOT is rated at 500kg/metre Square. Engineering documents are available on request. CAN I PURCHASE A CUSTOM SHAPED STAGE? Certainly! 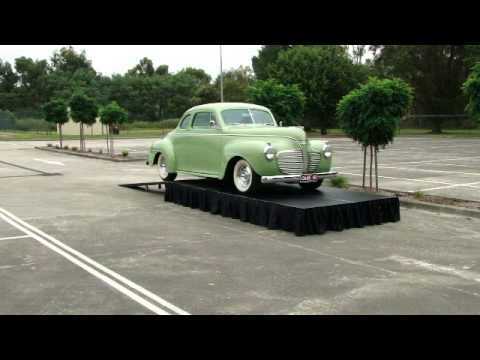 We manufacture ALL our Stages here in Australia and can customise to almost any requirement! Custom finishes are also available. WHAT ELSE CAN A STAGE BE USED FOR? The use of our Stages is only limited by your imagination. By simply changing the height of the legs and the layout, our Stages can be used for Tiered Seating, Catwalks, Tables, Choir Risers and more! STORAGE SPACE IS AN ISSUE – HOW DOES THE STAGE PACK AWAY? 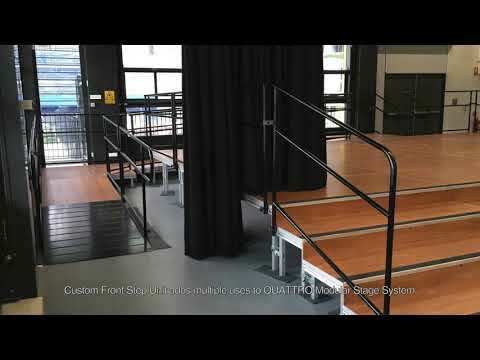 The QUATTRO Portable & PILOT Portable Stages are very compact to store, with upto 40m2 or 20 podiums (2 X 1 metres) storing in a 2 X 1 metre footprint. These systems use the unique Storage trolley kit, consisting of 4 wheels, a handle and a strap. This means no bulky trolley to store when the Stage is set up! The MELBA & QUATTRO Fold & Rolls have an inbuilt folding trolley, making storage and relocation a very simple task. COULD I HAVE A GRAND PIANO ON THE STAGE? Certainly! Our stages have a load rating of 500 – 750kg per m2, the average grand piano weights 300 – 400kg.